It's been more than 80 years since the lovable Winnie the Pooh was showcased in a new adventure. 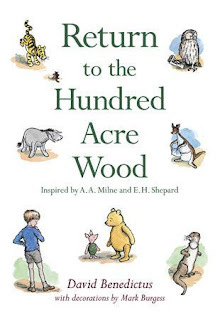 Next Monday on October 5, the sequel to the 'House on Pooh Corner' titled 'Return to the Hundred Acre Wood' will be available on book shelves everywhere to entertain kids of all ages. Author David Benedictus is now in the care of Christopher Robin, Pooh, Eeyore & the gang, and has shocked many book critics by introducing a *new* character to the Wood, Lottie the Otter. This announcement made me realize that Kanga was the ONLY female in the Pooh tales. And now, she finally gets a female friend to hang out with. It's about time too. Eighty years is a long time to wait for a bosom buddy. Thank goodness Kanga had baby Roo to care for all these years. Like most mums, she was probably far too busy with her baby to moan about a lack of girlie get-togethers. Honestly, I can see why some folk are getting all in a huff over this new Pooh addition. Beloved stories are normally not subject to updating or change -- they are what they are -- and many of us like them to stay that way, thank you very much, but if the addition to the story isn't jarring and fits in with the other characters, is it so wrong? These stories are primarily aimed at children and they won't mind a new friend for Pooh & Piglet one bit! It's always the adults who get all in a lather about such stuff while the kiddies just enjoy it for what it is - in this case, a wonderfully heartfelt story featuring lovable characters. I think these overly critical adults should stop fretting like Eeyore and chill like Pooh!